Most Americans wildly overestimate foreign aid as a percentage of the federal budget, which makes it unsurprising that U.S. foreign aid programs once again find themselves at the center of the debate as the budget battles heat up in Washington. Policymakers are seemingly divided into two camps: those who want to deeply cut foreign aid and those who want to maintain spending levels and make programs work more effectively. But there is a third way that makes a great deal of sense. It saves taxpayers billions of dollars and will make aid programs more effective and more likely to produce lasting results. This brief details how the new Congress could save more than $500 million annually by eliminating unnecessary regulations currently in place that are incredibly wasteful, anti- competitive, and make it harder to carry out effective development programs abroad. Additional savings and efficiencies can also come through the reform of earmarks related to the foreign assistance accounts. Lawmakers can save at least $1.5 billion more by cutting domestic agricultural subsidies. Besides wasting a great deal of money, the regulations discussed in this paper have one other key aspect in common: They have survived largely because of intense lobbying by special interest groups that directly benefit from their perpetuation. If the new Congress is serious about both cost savings and reform it should take five steps to eliminate outdated laws and regulations that hit the American taxpayer the hardest when it comes to foreign aid programs. We examine each of these steps in the pages that follow. Cargo preference is the poster child for a set of regulations that are old, ineffective, and very difficult to get rid of inside the beltway because of traditional pork barrel politics and well-connected lobbyists. In a nutshell, cargo preference mandates that 75 percent of all U.S. food aid commodities be shipped aboard U.S. flagged vessels, or ships registered in the United States. The original legislation that created cargo preference was passed in 1936, with the food-aid specific provisions added in 1954. Cargo preference was originally established because the U.S. military wanted to ensure that cargo ships and crews were available to serve as an adequate naval reserve in times of war. But it has been apparent for decades that cargo preference for food aid no longer serves its original purpose. It also makes it significantly more difficult to deliver food assistance in a timely, cost-effective fashion to people in need. As early as 1994 the Government Accounting Office, or GAO, noted that the Pentagon no longer saw any real purpose in the ships carrying food aid and their crews serving as some kind of marine reserve. Simply put, there is no military purpose whatsoever served by the current cargo preference regulations. Further, this same GAO report noted that these regulations added an estimated $200 million annually to the cost of delivering food assistance abroad. A more recent academic study concluded that cargo preference cost American taxpayers $140 million in 2006 in unnecessary transportation costs. Cargo preference rules are really a massive, ongoing subsidy to a well-connected elite of U.S. shipping companies. The primary defense of maintaining this cargo preference practice comes from reports prepared by lobbyists and contractors with direct ties to the firms that reap correlating benefits. Virtually every independent analysis has called for a major overhaul of the program or its complete elimination. Eliminating the practice would lead to greater efficiency in food aid programs. Due to current practices only about one-third of federal food aid spending actually buys food. The rest goes toward shipping and other logistical and administrative costs.The logistical cost of U.S. food aid shipments is 60 percent higher than our European counterparts, primarily due to cargo preference regulations. The current regulations are so ineffective that there have been repeated instances where the U.S. government has been unable to buy the best-priced agricultural commodities or the most appropriate ones for a particular humanitarian situation simply because U.S. flagged ships were not available at the port where these commodities were located. Lest anyone consider this a broadside against the U.S. maritime industry, it should be noted that the Maritime Security Program provides financial support to commercial ship operators, primarily container ship operators, for vessels as well as other logistical support that could be made available to the Department of Defense upon request. If policymakers believe that U.S. shippers need assistance, then it should be provided through programs expressly for this purpose instead of trying to inefficiently “multipurpose” other programs such as international food aid. It’s ironic that as U.S. development programs try to promote free markets and competition abroad U.S. development officials are prevented by an arcane law from shipping U.S. food aid by the cheapest and most effective means available. U.S. taxpayers should be assured that contracts to ship U.S. food aid are awarded to the lowest and most capable bidder. Congress could eliminate cargo preference and free up hundreds of millions of dollars annually that could be better served either going toward deficit reduction or being applied to the actual purchase of commodities rather than providing a taxpayer subsidy for U.S. shippers. U.S. shippers should succeed on the merits of their skills and competiveness—not because they are underwritten by a perpetual government subsidy. Like cargo preference regulations, the practice of monetizing food aid continues even though it makes little sense. It is both costly and ineffective to the point that it actually makes promoting economic development more difficult, not less. Monetization of food aid is less complicated than the name suggests. Under food aid regulations the U.S. Agency for International Development, or USAID, is allowed to have private voluntary organizations, or PVOs, sell a portion of the food aid they receive from the United States on local markets in or near needy countries and then use the proceeds of these sales to finance development projects or help pay for the costs of distributing other food aid. Some organizations have come to rely on this sale of food aid as a significant source of revenue in their budgets. The program was initially designed in 1985 to help cover the administrative costs of PVOs. It expanded in 1988 to underwrite development projects. In 1996, 28 percent of nonemergency food aid was monetized and sold by PVOs. Since 2001 this level has more than doubled to 60 percent of U.S. nonemergency food aid at a total of $400 million. Development experts have come to view monetizing food aid as counterproductive despite the increase in the practice. Perhaps most importantly, when international NGOs sell agricultural products on the local market it can make it harder for local farmers to be economically successful because they are competing with imported commodities that are essentially being dumped on their markets. Monetizing food aid also undercuts important U.S. national interests as well. In 2002 the Office of Management and Budget found that monetization tends to discourage U.S. commercial exports, foster black market activity, and impede market development for U.S. agricultural products. The well-respected international aid group CARE International announced in 2007 that it was no longer going to monetize food aid both because it was expensive to manage and because of its potential impact on local development. So U.S. taxpayers foot the bill for $400 million in monetized aid, but the actual sale of this food on local markets only generates between $200 million to $280 million for the private voluntary organizations selling this food. The solution seems obvious: Providing these PVOs with cash to use for development and relief operations rather than food to sell would save U.S. taxpayers between $120 million to 200 million annually. Ending monetization would make development programs more effective and give developing economies a far better chance to establish free markets that attract private capital and no longer require U.S. assistance. Foreign assistance for agriculture and food security will potentially increase under the administration’s Feed the Future initiative, which is designed to address global hunger and food insecurity. So PVOs should be given greater access to development assistance as a replacement-funding source if aid is no longer monetized. USAID has proposed doing just that with Community Development funds. The United States is the only major donor that monetizes food aid. The practice just doesn’t make sense. As Oxfam has noted, such food aid can crowd out the demand for other imports in developing countries. It also does not create an expanded market for U.S. agricultural exports and tends to make recipients more dependent—not less— on food aid. Far from proving a boon to small farmers as their defenders are quick to claim, domestic U.S. agricultural subsidies overwhelmingly favor a handful of large producers. More than 60 percent of the subsidies flow to just 10 percent of the recipients. Once again we see a case where U.S. development programs are trying to promote open markets and free trade around the globe but these efforts are directly undercut by anti- free-market activities here at home. Again, this vastly inefficient system of U.S. agricultural subsidies has survived because of the fierce inside-the-beltway lobbying of those very same groups and producers who benefit from these subsidies. There is little evidence that this massive and expensive subsidy system makes Americans more secure, produces more food at less expensive prices, or advances U.S. interests around the globe. So does the current Congress have the fortitude to take on these subsidies? If the United States were to end its agricultural subsidies it would be far better positioned to push European states to do the same. What is remarkable is that both the United States and Europe have kept up these subsidies due to short-term political pressure despite the fact that both would benefit, not suffer, with a more open playing field. For the world as a whole, one can conclude on the basis of the studies CBO examined that if all policies distorting agricultural trade were phased out by the end of this decade, the likely total annual economic benefit by the middle of the next decade from resulting efficiency gains and investment growth would be in the range of $50 billion to $185 billion, or 0.1 percent to 0.4 percent of the value of world output of all goods and services, or roughly 3 percent to 13 percent of the value added by world agriculture. Any close examination of the current agriculture subsidies in the United States quickly reveals what an absurd system we now have in place. Indeed, a 2006 survey byThe Washington Post found that the U.S. government paid more than $1.3 billion in subsidies between 2000 and 2006 to individuals who do no farming at all. The Food for Peace law requiring food aid to be purchased in the United States is another example of a program designed to respond to international humanitarian need that also aims to serve domestic interests. The Government Accountability Office estimates that it takes an average of four to six months for U.S. in-kind food aid to reach its final destination—four to six months after the onset of a food crisis. Why so long? According to U.S. law, food aid must be purchased in the United States and, as we mentioned earlier, shipped on U.S.-flag vessels from a U.S. port before it can reach those in need. The United States annually provides about half of all food aid globally. An inefficient U.S. system means that people suffer. From 2006 to 2008 our funding for food aid increased by 53 percent but the tonnage of food delivered to the needy actually fell by 5 percent. The reason? 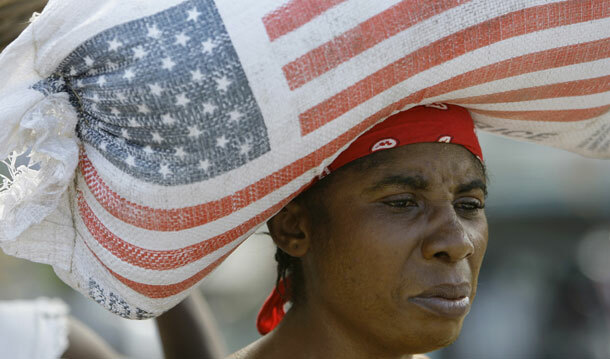 USAID has estimated that in fiscal year 2006 nearly half of its food aid resources were allocated for transportation costs rather than actual aid. Local and regional procurement of food aid, or LRP, would save money and lives. A 2009 Government Accounting Office report concluded that the local or regional procurement of food would reduce costs by 25 percent and reduce delivery times from an average of 147 days to 41 days. Buying more food closer to where it is needed is not a new idea, either. President George W. Bush proposed in four successive budgets to use up to 25 percent of P.L. 480 food aid (the Food for Peace Program which represents the major authorities for delivering U.S. international food aid abroad) for LRP, as did his 2008 Farm Bill proposal. Congress, however, refused to go along. The influence of U.S. commodity groups allied with private voluntary organizations, agribusiness, and shippers was just too strong. Instead agriculture committee authorizers included a minuscule pilot program for LRP that lasts through 2011 even while appropriators have continued to increase USAID funds for LRP. This dynamic has essentially pitted the Congressional Agriculture Committees, which have been reluctant to allow changes in authorities governing how U.S. food aid is managed, against the Foreign Affairs committees, which recognize the cost effectiveness and efficiencies in expanding LRP programs. Advocates argue that tying food aid to benefit U.S. farmers increases the American public’s support for assistance. But at what cost? Would the public be as supportive if it knew that transportation expenses were increasing costs by 25 percent? Clearly not. The cost does not justify the benefit. As Congress re-evaluates the role of earmarks and their impact on budget deficits it might want to consider how the directives in the annual State Department-foreign operations appropriation bills make aid less effective and make funding decisions more difficult. When almost all our foreign assistance accounts are earmarked by country and even by sector—education, water, health, agriculture, and so forth— agencies have very little discretion or flexibility to seize new opportunities for advancing U.S. interests or respond to new developments or crises. It is expected and necessary that Congress determine funding levels of programs and accounts. It is even helpful when Congress uses “report language,” or the committee report that accompanies an appropriations bill, to express support for particular approaches or projects. But Congress goes much further in the appropriation bills and accompanying reports, annually determining how much should go to each country out of nearly every assistance account and how much should go toward water projects, basic education, higher education, microfinance, environment, health, and so on. And that’s not all. Drill down deeper into each of these sectors and you find directives on how much to spend on each disease, disorder, or cure. It can take the State Department and USAID many months to put together a spending plan that reflects congressional directives, which leaves them precious little time to spend the money wisely before the fiscal year ends. Congress’s propensity to micromanage is fed by an executive branch that is reluctant to share information and explain objectives, and by a growing number of private actors who lobby Congress for additional resources for their area of specialization. This sets up an unhealthy competition among sectors that does not reflect a coherent foreign assistance strategy. Congress should still provide funding levels for accounts and even major programs but should otherwise allow agency experts to put resources where they are needed most, taking congressional preferences into account. Report language and requirements for annual reports to Congress on specific sectors of development work can contribute to an interbranch dialogue on preferences. It should be noted that the House-passed funding bill for FY 2011 (H.R. 1) uses soft earmarks that had previously been hard. It will take genuine political will to make the cuts detailed in this paper. But the alter- natives are far less attractive and would entail making major cuts in programs that are effectively saving lives, advancing the national interest, and promoting development around the globe. Ending cargo preference and monetized food aid, significantly cutting U.S. agricultural subsidies, increasing the local and regional procurement of food aid, and allowing the administration greater flexibility in how it conducts development programs will save money, save lives, and vastly improve how America conducts international development. At a time when we are making incredibly difficult budget choices in international affairs, why should Congress choose to cut bone when such obvious fat is available to be trimmed?